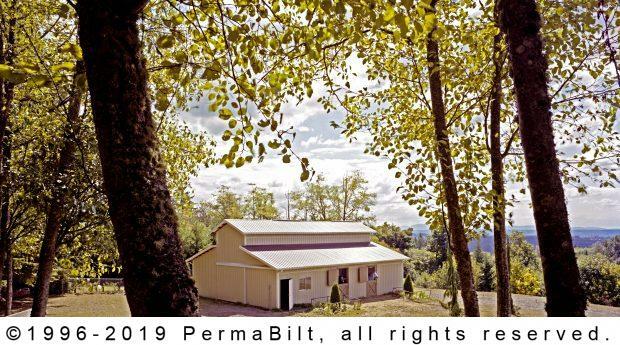 PermaBilt®, since 1973, has built over 20,000 plus freestanding post frame buildings. And, on occasion, we have built extensions to existing buildings. And that was the case with our Duvall Washington customer who wanted an add-on to their existing monitor horse barn, one that we had constructed several years prior. Needing more room for feed, gear and storage, our customer needed the additional space. With the building extension, he requested some of the following design elements: For example,2) 4’x8’ split opening wood Dutch doors were added. Also, he requested a 2 foot poly eave-light running the length of the garage to provide natural interior light. Overall, the extension was a comfortable project having built the original building. More importantly, our customer was pleased.